£450 - £900 / week. Surrounded by mountains in Scotland's first national park, this family home is located in the heart of Rob Roy country, just 75-90 minutes drive from Edinburgh/Glasgow respectively. As well as the spectacular scenery, there are plenty of activities available in the vicinity, including walking, fishing, golf, cycling, horseriding, shooting and watersports. The cottage offers spacious and bright living accomodation for up to six people in three bedrooms - two ground floor double bedrooms (one with ensuite shower room) and an upstairs twin room, together with large family bathroom. It has a spacious sitting room with TV/DVD player and open fireplace, a large country kitchen with electric range cooker, microwave, dishwasher and fridge-freezer, and a laundry room complete with washing machine and tumble dryer. 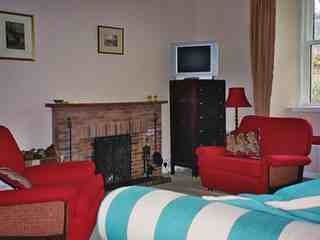 Electric heating throughout - bedlinen, heating and towels are all included. Cot and high chair available. No pets and no smoking. "What a delightful setting and how great to see so much sunshine"
"Thank you for a most fabulous place to stay in a superb part of the country. We had a ball here...and in no small part to the wonderful accommodation in your lovely home...the only downside was having to leave!" 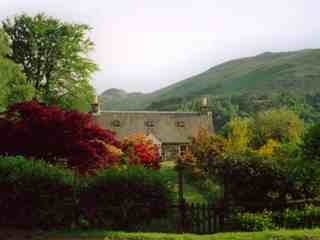 "House perfect for us - lovely meals around kitchen table. Could write pages, we had a fantastic holiday and even the weather surprised us - calm amazing skies"
"I like it here because there are loads of things to do e.g. swimming, biking and walking up to Manse Rock, which is quite a trek."